Ram Oraon blames his grandfather for his frail health and for much of his life spent battling poverty. He has watched his two brothers die young. “They always had poor health,” says the 60-year-old marginal farmer from Malhan Bhuiyadih village near Ranchi. Over the years, Oraon has realised the reason for his family’s sufferings. “Like other farmers in my village, my grandfather would grow rice and potato, and we would eat mostly that. He never saw profit in vegetable, nor was he aware of its health benefits,” he says. Though late in his life, Oraon has done a course correction. About a decade ago, he shifted from the staple crops to vegetables. Showing off a basketful of freshly plucked brinjals from his farm and a bundle of notes, Oraon says, “Now we are healthy and a bit wealthy.” This holds true for most families in his tribal village now. Lured by a booming vegetable market, farmers of Malhan Bhuiyadih and several other villages in Ranchi have dumped paddy and other staple crops for growing the greens. The district now supplies vegetables to flood-prone Bihar, West Bengal, Jharkhand and Odisha, and has earned a new distinction: the vegetable basket of Jharkhand. “By growing vegetables, the tribal population is not only earning a handsome profit, lately they have also started regularly including the nutritious greens in their diet,” says Shivendra Kumar, head of the Indian Council of Agricultural Research (ICAR), Eastern Region, in Patna. Ramesh Sharan, professor of economics at Ranchi University, says vegetable is the new economy of the drought-ravaged state. About a decade ago, farmers in Malhan Bhuiyadih grew vegetables and paddy in the ratio of 40:60. “Now, we grow paddy only on 25 per cent of our land,” says Haldar Mahto, Oraon’s neighbour. The Economic Survey of Jharkhand shows some 80,000 hectares (ha) have been brought under vegetable cultivation in the last decade. In 2000, vegetables were grown on 150,000 ha. There has also been a drastic change in the agricultural employment pattern. While in 1983 vegetable farming employed very few farmers, it now employs 2.3 per cent of the state’s farmers. 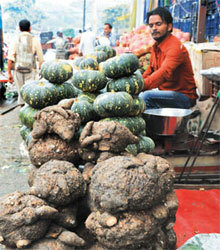 Traders from as far as Delhi throng the state’s rural weekly markets to procure vegetables. To harness the potential of the new economy, traders in the state are dema nding a special train to ferry vegetables to far off cities like Bengaluru and Mumbai. India follows Jharkhand’s trajectory in vegetable farming. Farmers from across the country, particularly those in drought-prone regions, are waking up to the potential of the crop that has been traditionally considered a riskier proposition due to a shorter shelf life. In the process they have earn ed India the status of being the world’s largest vegetable producer after China. Popular perception is that farmers shifted to vegetables only in the past four years to exploit the price rise. But the trend has been around for nearly a decade. States like Jharkhand, Jammu and Kashmir, Madhya Pradesh and Odisha that witness frequent droughts reported the first significant switchover. Those who observe farmers at close quarters say the shift is a coping mechanism in the face of frequent monsoon failure and prevailing agrarian crisis. “Since 2000, drought has been regular in several districts of Madhya Pradesh and Uttar Pradesh. These are the districts where most farmers have resorted to vegetable cultivation,” says Sanjay Singh, a social worker in Jhansi. In 2010, faced with six consecutive years of drought in the Bundelkhand region, the Madhya Pradesh government called a special session of the Legislative Assem bly to discuss ways to make farming profitable. One of the key strategies was to increase the area under vegetables by 500,000 ha. In 2012-13, the state received an award from the Centre for the highest growth in vegetable production in the country. “Farmers will do what will help them earn a bit more,” says Ajay Vir Jakhar, chairperson of Bharat Krishak Samaj, a farmers’ association. “Growing vegetables is the most profitable proposition available now, especially for small and marginal farmers.” What is also pushing farmers to switch to vegetables is the shrinking farm size. The average agriculture landholding in the country in 2010 was 1.22 ha. It was almost double (2.28 ha) 40 years ago. Staple crops like wheat and paddy are less productive and thus less profitable when grown on small farms. In such a situation, a farmer can increase yield only by using high-cost farm inputs. Besides, cereal crops require assured irrigation. Given that 60 per cent of India’s farmland is rain-fed, farmers are not willing to take the risk. In 2007, the Indian Council for Research on International Economic Relation (ICRIER) did a comprehensive cost-benefit analysis of growing vegetables among other horticulture products. It found the shift to horticulture was faster in recent years due to declining benefits from cereals. For each unit of investment in vegetables the return was alm ost double; returns were half for cer eal crops. “This implies it is profitable to cultivate fruits and vegetables rather than cereals,” ICRIER report concludes. What came as an opportunity at the right time was the changing food preferences of people. Consumers now prefer vegetables and other high-value commodities like fruits and livestock products to cereals due to rising income and changing lifestyle. Periodic surveys by the National Sample Survey Office show a clear shift from food grains towards fruits and vegetables, livestock products and fisheries. These are the products responsible for the high and persistent food inflation in the past five to seven years. Yet their share among all food items consumed remains high: 47.4 per cent in 2007-08, up from 41.3 per cent in 1993-94 and 37.3 per cent in 1983-84. Between 2005 and 2010, vegetable consumption alone went up by 30 per cent in urban areas and 40 per cent in rural areas (see ‘Rise in consumption’ below). “The agriculture sector is responding to the change in overall consumption pattern,” says M S Sandhu, director of the Department of Agricult ure, Punjab. Fruits and vegetables now contribute more than 30 per cent to the value of overall agricultural output in states like Himachal Pradesh, Odisha, West Bengal, Jammu and Kashmir, Bihar and northeastern states, according to the National Horticulture Board. That farmers are preferring vegetables over other crops is also clear from the farm employment data. Anjani Kumar of the National Centre for Agricultural Econo mics and Policy Research (NCAP), New Delhi, says while more people are engaged in agriculture, there is a significant diversification within the sector. Employment in staple crops has gone down and that in horticulture, which includes vegetable farming, is picking up. The share of horticulture in crop sector employment was 1.9 per cent till 1993-94. It reached 3.5 per cent in 2009-10, despite it being a severe drought year. This year, its share is expected to rise to five per cent. This increase in share, Kumar’s study shows, is mostly because of small and marginal farmers. Dismayed by erratic monsoon and uncertain returns from staple crops, particularly paddy, small and marginal farmers across the country have found refuge in vegetable farming. They contribute 70 per cent of the total vegetable produced in the country while they own just 44 per cent of land, says a report of the Planning Commission Working Group on Horticulture. Mahendra Dev, who has studied changing cropping pattern in India, explains this anomaly. Small and marginal farmers are increasingly using part of their land for vegetables as the costbenefit calculation favours them. The cash return on vegetables is frequent and even more than on fruits, the other profitable horticulture crop. Ecology and economics of vegetable cultivation support this transition. On an average a farmer needs one cubic metre of water to produce 330 grams of grains. The same quantity of water is sufficient to grow about 18 kg of vegetables. Besides, paddy takes more than 100 days to mature and the yield is uncertain. It also requires bigger land for better profitability. Small and marginal farmers can use their small pieces of land to grow four to five crops of vegetables in a year. Unlike the price of cereal crops that is determined by market forces, Haldar Mahto says “we dictate the price of cucumbers and tomatoes we grow”. A farmer can sell his/her crops in the local market every week. In case of paddy, they had to wait for close to four months in hope of better returns. land under vegetable has not grown much—115,140 ha has been brought under vegetables across the country in the past five years—its production has soared by 65 per cent between 2001 and 2011 (see ‘Production booms’). The average yield per hectare has also increased: from 12.2 tonnes to 16.7 tonnes (see ‘Productivity grows too’). “Vegetable production is growing the fastest among all horticulture wings. This is a trend that will decide the overall agricultural growth,” says Sanjeev Chopra, director of National Horti - culture Mission and joint secretary with the Union Ministry of Agriculture. The Union government now pins its hopes on vegetables to achieve the four per cent agricultural growth target during the 12th Five-Year Plan. Initiative for Urban Cluster (NVIUC) to meet the demand of urban vegetable consumers. Last year the initiative received Rs.300 crore to encourage vegetable cultivation. This was the first such programme to target vegetables. With the newfound focus and government support, vegetable production has witnessed a significant growth in 16 states. One such state is Sikkim where vegetable production has more than doubled in a decade. Nestled in the hills of East Sikkim, about an hour’s drive from state capital, Gangtok, is the house of Chandra Subba. An occasional daily wager from Nimtar village, Subba is a marginal farmer with a few cents of an acre (0.4 ha). It is his fourth year into growing Romeo tomatoes, a hybrid variety imported from Japan, and he is quite upbeat about it. In a year, Subba manages to harvest two tomato crops, earning a profit of Rs.20,000. Earlier, he would grow millets and corn from the same patch. It was just enough to sustain his family. Subba drew inspiration from his neighbour Y T Lepcha, who gave up a government job to sell tomatoes. In 2009 he sold tomatoes worth Rs.2.5 lakh in five months, and won the state’s progressive farmer award. Lepcha owes his success to the Centre’s thrust on vegetable cultivation, which the state took up with gusto. Since the Sikkim government implemented NVIUC in 2007-08, K T Bhutia, additional director of the state horticulture department, says the state has been producing about 80,000 tonnes of vegetables a year, up from 55,000 tonnes in 2006-07. This is enough to meet 70 per cent of the state’s requirement. Keeping in mind a ready market due to tourism, the primary revenue earner for the state, the state government promotes exotic vegetables like broccoli, lettuce, tomato and capsicum to cater to more sophisticated palates. It also provides farmers with seeds, polyhouses, composting pits, saplings and irrigation facilities and trains them in clusters. In West Sikkim, Mikma Lepcha belongs to a cluster of 100 farm households. 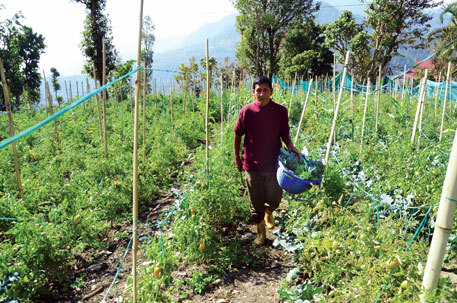 After being trained by field assistants of the horticulture department, Lepcha has set up a polyhouse and grows winter vegetables like broccoli, Chinese spinach, cabbage, squash and the popular Romeo tomatoes even in summer. On an average he earns Rs.1,000 a week from his half-a-hectare farm. Lepcha says he has given up paddy since he has been introduced to vegetables, but continues to grow maize and millets for home consumption. Sikkim’s thrust on vegetables has only marginally impacted the production of food grains and the area under the crops. Since vegetables are shortduration crops of about 70 days, a chunk of it is produced during off-season without jeopardising kharif and rabi crops. Of the 75,000 tonnes of vegetables Sikkim produced in 2010-11, about 30,000 tonnes were grown in the offseason, between March and May. Renuka Sapota, a farmer from Assam Lengzi cluster in East Sikkim, says the conducive climate of the lower Himalayan state is a boon for vegetable farmers, who can grow winter vegetables even during summers. “Earlier, we would eat tomatoes only during the winters when it came from Siliguri. Now home-grown tomatoes are available throughout the year.” Though little, most of the produce Sikkim exports to other states are offseason vegetables. “Last year Sikkim exported about 375 tonnes of tomatoes, cauliflower, cabbage and radish during the off-season,” says Bhutia. This is only a miniscule supply when compared to the burgeoning demand for vegetables from across the country as well as abroad. The demand for vegetables is expected to rise at 4-5 per cent per annum over the next 15 years. To meet the demand as well as help the agriculture sector achieve the desired four per cent growth during the 12th Plan period, the vegetable sector must grow by 7.5 per cent till 2017. 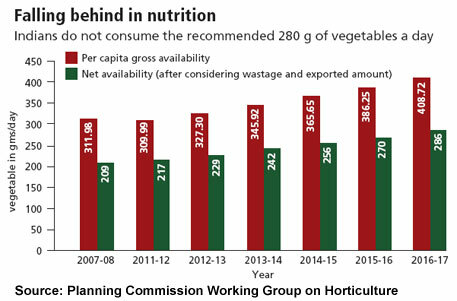 It is only with this rate of growth that Indians will be able to have the recommended 280 gm per capita per day of vegetables by 2016-17. According to a 2007 World Bank analysis of India’s horticulture sector, despite the country’s large size and potential, its share in global agriculture exports is minuscule. India produces nearly 11 per cent of the world’s vegetables, while its share in global exports of vegetables is only 1.7 per cent. The demand-supply imbalance is already playing out as high food price inflation. It has also become a major political issue as the government seeks re-election in 2014. In March this year when the Central Statistical Office released the consumer price inflation data, it was a shocker. The price of vegetables had spiked by 21.29 per cent since last year. This is the fifth consecutive month when overall inflation has been dominantly caused by vegetable price rise. During the period, vegetable prices have soared by 80 per cent—the steepest rise among all commodities that decide overall inflation. Interest ingly, the price rise is not just an urban phenomenon. Rural areas also show a similar trend. is emerging as a key driver of the overall inflation. Why is a country with an enormous vegetable diversity struggling to grow enough of it? The problems are multifaceted: loss of vegetable biodiversity, nascent and inadequate focus of the government, lack of scientific research and extension services for vegetable farming, and problems of storing vegetables. India’s agro-climatic zones are suitable for undertaking a large number of vegetables round the year. Of the 400- odd vegetable species in the world, about 80 are reported to have originated in India. The Indian Institute of Vegetable Research, a unit of the Indian Council of Agricultural Research (ICAR), has a germ plasm repository of 4,548 cultivated and wild vegetable species. Despite this diversity, only 60 varieties are cultivated in the country (see ‘Neglected vegetables’). It is difficult to miss the sight of a man or woman sitting aloof from the hustle and bustle of a rural weekly market and selling some strange-looking vegetables. Appro - ach them, and the seller will elaborate how rare the vegetables are and what difficulty he or she undertook to procure them. The seller might also share a story about a famine and the vegetable’s role in averting a large number of hunger deaths.These lonely sellers represent the state of India’s indigenous vegetables. Notwithstanding the increase in production and consumption of vegetables, indigenous vegetables remain marginalised. There is no information on whether a vegetable is vanishing. Warwick Easdown, regional director of The World Vegetable Center, a nonprofit research organisation based in Taiwan, says there is a lack of “precise statistics on the list of Indian indigenous vegetables”, especially when it comes to identifying those that are near extinction. A nostalgic M S Swaminathan, noted agriculture scientist, says, “When I was young our diet consisted of a wide range of beans, cucumbers, tuber crops and leafy vegetables. Many of them have vanished today. We are gradually causing a diminution of culinary diversity.” He remembers that the earlier versions of dishes like avial, a typical South Indian preparation with at least one dozen vegetables, had a number of indigenous vegetables. “This dish is also disappearing from the South Indian plate,” he adds. Global diversity in vegetable crops is estimated at about 400 species. About 80 species of major and minor vegetables are reported to have originated in India. A recent study published in the open access journal Phytokeys says cucumber family, Cucurbitaceae, which includes pumpkin, melon, cucumber, watermelon, bottle gourd and bitter gourd, can be traced to India. Molecular data analysed by the scientists revealed that both cucumber (Cucumis sativus L) and melon (Cucumis melo L) are likely to have originated in the foothills of the Himalaya. But somehow these vegetables have been dropped from our grocery shopping list. The legume family is another good example of indigenous vegetable that is vital to our diets. It is the third largest flowering plants family with approximately 650 genera and nearly 20,000 species. Several lesser known leguminous vegetable crops have tremendous economic potential. “The ‘well-known’ vegetables are easier to grow, manage and sell, and seed availability is not a problem,” observes Easdown. But since the native vegetables have always been associated with poverty, they do not look attractive and, therefore, never end up in the rich consumer’s food basket, Easdown says. He warns that there is an “urgent need to spread knowledge about the heritage, nutrition and calorie values” of traditional vegetables in India. Unless people start including indigenous vegetables in their diet and farmers earn money from them, they will disappear, and so will traditional cuisines, Easdown adds. N Anil Kumar, programme director of Community Agrobiodiversity Centre of nonprofit M S Swaminathan Research Foundation, says, “We eat agro-biodiversity. Thus genetic diversity of species is important to food, nutritional and economic security in the country.” Kumar recommends that researchers should identify the indigenous vegetables based on their agro-biodiversity and then allow for clear and concise characterisation. “This will help build nutrition literacy among end consumers,” he says. Analysts blame it on lack of research work on Indian vegetables. Propelled by Green Revolu tion, most research works focused on cereal crops. It is only recently that policy makers have realized the impact of vegetables on local economy and overall health. Several institutions under ICAR and state agricultural universities are conducting studies on vegetables, but they are limited to popular ones, such as tomato, brinjal, chilli, cauliflower, cabbage and peas. Agricultural extension services are also limited to these crops. Worse, India still does not have a system of collating information on vegetable production. In 1983-84, the Centre launched a pilot scheme called Crop Estimation Survey (Fruits and Vegetables) to collate information on seven vegetables. It is in practice in only 11 states. States do have their own mechanism to collect information, but it is not adequate and hardly organised. The research on vegetables and its extension to farms suffer from shortage of manpower in horticulture departments. There are only a handful of institutions under ICAR to deal with more than 30 varieties of crops. Though the Central allocation to horticulture increased from Rs.24.2 crore in the First Five-Year Plan to Rs.16,235 crore in the 11th Plan, there is a consistent decline in number of professionals in-charge of horticulture. Across the country 33 per cent of sanctioned positions are lying vacant. In Jharkhand and West Bengal, it is more than 70 per cent. “Of the Rs.300 crore fund allocated by the Centre for crop diversification last year, most will be spent as subsidy. Why do we not spend the fund on extension services for horticulture?” asks Jakhar of Bharat Krishak Samaj. Haldar Mahto and Ram Oraon say monsoon rains money for vegetable growers of Jharkhand. The income spirals to such an extent that the cost of land, diesel generator sets and farm equipment peaks during the season. But despair prevails when it does not rain. Even Ranchi, which boasts being the vegetable basket of the state, lacks a proper irrigation system and entirely depends on rain. 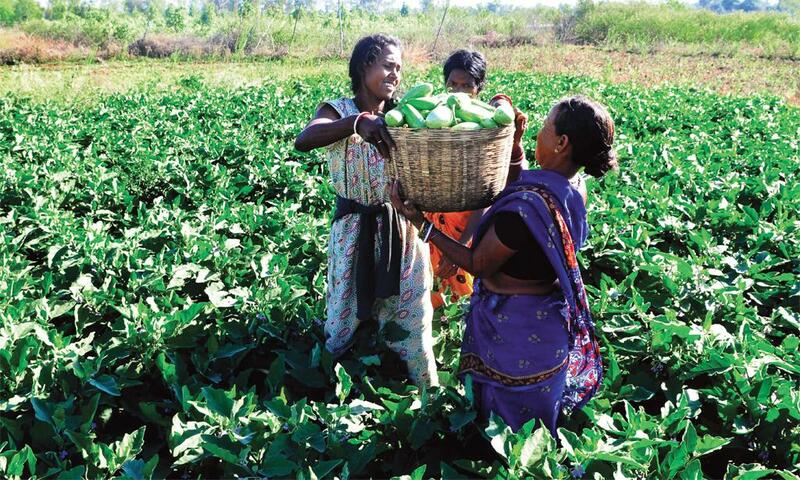 In 1999-2000, farmers in Jharkhand harvested 20 tonnes of vegetables from a hectare. The yield rate slipped to 14.5 tonnes between 2001 and 2004. Pointing towards a well dug under the Million Wells Scheme, a poverty alleviation programme of the Centre, Mahto says, “It is the only source of water for our fields. But it dries up during summers.” Farmers from Malhan Bhuiy adih have requested the district administration several times to construct a check dam at the nearby burses river to ensure irrigation to their fields. They even blocked the road leading to the block development office. Their demand is yet to be met. This summer they plan not to grow vegetables. Even if they did, they would incur losses. Most vegetables have a shelf life of 24 to 48 hours. But there is not enough cold storage facilities to cater to the rising production. In Jharkhand, 25-40 per cent of vegetables rot or suffer quality damage by the time they reach market due to lack of cold storage facilities. Inappropriate packaging and poor transport make it worse. This often negates the increased production. Without cold storage facilities, farmers will not be able to store their produce for long to sell during the off-season when it fetches higher price or sell in far away markets for a better rate. This also limits their access to the lucrative export markets. R G Agrawal, chairperson of Dhanuka Agritech Ltd, an agro-business company in Gurgaon, says lack of cold storage facilities is the main reason vegetable farmers fail to benefit from the high market price. Loss of vegetables further escalates their price. “Farmers have been able to enhance income through upgraded vegetable cultivation but this enhancement is not meeting its target,” says Kumar of ICAR. Loss of vegetables is not only a loss of farmer’s income, it is also a loss to the national health, he adds. Law that controls local agriculture market is another stumbling block that can withheld the growth of the vegetable sector. In 2007, addressing a long-pending demand of fruit and vegetable farmers, the Centre amended the Agricultural Produces Market Comm ittee (APMC) Act and kept perishable items out of the ambit of the Act. The model APMC Act allows farmers to directly sell their produce to traders instead of going through a government-regulated market. But only 16 states have so far adopted it. Those who adopted are already benefitting from the reforms. While adopting the model APMC Act, Madhya Pradesh, for instance, exempted its vegetable and fruit farmers from paying market tax. It also allowed private companies to buy vegetables directly from farmers. Government officials say this reform is a key incentive for vegetable farming in the state and is responsible for increase in production. Farmers have responded to the changing dietary situation as a survival strategy. Unlike Green Revolution when government engineered a change in cropping pattern, here they have evolved their own mechanism. And as it emerges, vegetable growth now critically decides the country’s overall agricultural growth. As the government extends Green Revolution, it may not be sustained without taking care of the vegetable surge. A very insightful report on vegetable farming in India. Both government and private companies need to make more investments in this sector by developing food processing and supply chain infrastructure. Then every citizen would have access to healthy, locally grown fruits and vegetables. Right now most people suffer from vitamin deficiencies due to inadequate fruits and vegetables in their diet. And the sad fact is that even if you go to a market in Mumbai to buy a regular fruit like apple, you are only offered overpriced varieties from Australia instead of native varieties from Indian states like Himachal Pradesh. Very interesting article with insightful statistics. It was heartening to note that the vegetable consumption of the farmers themselves has grown. This trend, I wish, must be consciously highlighted through the producer-farmer community to the extent that only after the own or nearby community's requirements are fulfilled, the farmers will sell the excess produce in market. This in turn will reduce the load on various systems such as transport, cold storages and free the farmers from market exploiting them. Investment in cold storage does not answer problems in many cases as seasonality in several vegetable crops has largely been overcome through research.It is freshness of veggies that fetches high price and profit. A quick and safe transport to advantage market is better solution. We need investment in rural haats where even best quality harvest is marketed in harsh weather condition and bulk produce handling system is pathetic. Bio-diverse vegetable farming is a big upcoming market and health opportunity but at present lesser known veggies have restricted market. Also, Organic farming is the need of the hour as the effects of pesticides and synthetic fertilizers on our health is a major concern. It will be worth examining the role of Private sector vegetable varieties vis a vis Public sector varieties in the new revolution described in this interesting article. When profit is the driver food and nutritional soveriegnity may take a back seat. Very interesting article. We work with tribal farmers in UP and thus understand the potential of horticulture in terms of nutirtion and cost benefit. The data and statistics provided in the article will be very helpful for guiding more people to adopt this. I also like the comparison part of water consumption connection. One side when this is positive sign for small farmers, I wonder why government policies do not support farmers for grain production. Production of grain is also equally important aspect of our agriculture. Congratulations to the farmers for bringing the change in vegetable production (Veggies delight DTE, April 15 2014) which has improved their health and wealth. Storage facilities are the real barriers in gaining the maximum benefit from their production. Though the shift is welcome from the farmers side, there is a need to balance the production keeping the need so the local people. With this pattern of balancing,farmers can do wonders to improve the their health & wealth as well as environment with improved sustainability and quality of life. Once there was interest in HYDROPONICS in India. Even Today in the west Hydroponics is popular. Hydroponics is a subset of hydro culture and is a method of growing plants using mineral nutrient solutions, in water, without soil. Terrestrial plants may be grown with their roots in the mineral nutrient solution only or in an inert medium, such as perlite, gravel, mineral wool, expanded clay or coconut husk. There are two chief merits of the soil-less cultivation of plants. First, hydroponics may potentially produce much higher crop yields. Also, hydroponics can be used in places where in-ground agriculture or gardening are not possible. Some commercial installations use no pesticides or herbicides, preferring integrated pest management techniques. There is often a price premium willingly paid by consumers for produce that is labelled "organic". Some states in the USA require soil as an essential to obtain organic certification. There are also overlapping and somewhat contradictory rules established by the US Federal Government, so some food grown with hydroponics can be certified organic. Hydroponics also saves water; it uses as little as 1Ã”Ã¼Ã¤20 the amount as a regular farm to produce the same amount of food. The water table can be impacted by the water use and run-off of chemicals from farms, but hydroponics may minimize impact as well as having the advantage that water use and water returns are easier to measure. This can save the farmer money by allowing reduced water use and the ability to measure consequences to the land around a farm. To increase plant growth, lighting systems such as metal-halide lamp for growing stage only or high-pressure sodium for growing/flowering/blooming stage are used to lengthen the day or to supplement natural sunshine if it is scarce. Metal halide emits more light in the blue spectrum, making it ideal for plant growth but is harmful to unprotected skin and can cause skin cancer. High-pressure sodium emits more light in the red spectrum, meaning that it is best suited for supplementing natural sunshine and can be used throughout the growing cycle. However, these lighting systems require large amounts of electricity to operate, making efficiency and safety very critical. The environment in a hydroponics greenhouse is tightly controlled for maximum efficiency, and this new mindset is called soil-less/controlled-environment agriculture (CEA). With this growers can make ultra-premium foods anywhere in the world, regardless of temperature and growing seasons. Growers monitor the temperature, humidity, and pH level constantly.